Long time reader of this forum, it has been very helpful with some issues we've had with our own property. I was wondering if anyone had any advice regarding another fence near our property. Without being able to put a picture on I will try and describe the situation as best I can. We have a shared drive with 3 surrounding properties with two areas of garden at the top. As you face up the drive one garden, belonging to one neighbour is on the left, the other garden, belonging to another neighbour on the right. the setup is rather like a capital letter 'T'. Neither of which gardens are mine by the way. The land beyond the fence is a privately owned field. One neighbour has laid a fence across the entirety of the top of their garden and across the shared bit of the drive, replacing an old broken fence, we know the owner of the field took issue with this at the time as the boundary belongs the them. Now, put simply, although I can understand them not wanting anyone to climb over on the part of the fence that runs along the top of their garden, can they stop people climbing over the fence that spans the shared part of the drive? Even though that particular boundary isn't technically theirs? No - can't picture it. You talk of sharing a drive with 3 other properties yet describe only two. You mention facing up the drive, but I haven't a clue whether you're looking from the end of your drive with your house behind you or what. I also can't picture what you mean about where the new fence has been built, particularly as you say it goes across the shared drive - it suggests that they are blocking the shared drive entirely. When you've posted 3 times you can upload a picture. You'll also have to specify the legal structure of the shared drive, what rights you have, and provide the wording by which you are granted those rights. Hi again, sorry, I thought I'd done well in explaining this but reading it again, maybe not. I'm trying to be as vague as possible in case our neighbours read this forum too. We have been involved in a lengthy and very stressful dispute regarding their attempt at adverse possession of a strip of our land and encroachment. Things have thankfully quietened down and I don't want to stoke up any further trouble. Ok, I'll try simplify my question, it's a very old row of cottages with a very confusing setup where gardens and paths are concerned. There is a shared drive that belongs to property A. Properties B (who we had the dispute with),C and D (mine) all have rights of way to use this drive for various levels of access to gardens and parking spots. The location and relation of my garden in this is irrelevant and would only confuse the question further, but as stated I have a right of way (foot or vehicle) at all times up the shared drive. Property A (the owner of the drive) has a divorced garden at the top of this drive on the left and property B's divorced garden is facing opposite on the right and in between is a section of boundary within neither garden. It really is shaped like a letter T, the main road being at the bottom, the drive being the vertical and the horizontal line of the T is the furthermost boundary of their gardens. The far boundary actually belongs to the owner of a field behind all of our properties and was marked off with a very old battered fence years ago. Property B replaced this fence with a new one a few years back, which I understand the owner of the field wasn't too happy with as they did it without prior consent. They didn't just replace the fence within their own garden, they replaced the section at the top of the shared drive too (without the consent of property A). This particular section of land and boundary doesn't belong to them but they fenced it anyway. Now, this field has a public footpath in it and since we have lived in our house we have always walked up the shared drive and climbed over this particular bit of fence to join the footpath. our kids hop over into the field to build dens in the hedgerow just behind our houses. Property B have now started saying we can't hop over this fence now as it belongs to them even though property A, who own this section of shared drive, don't mind us doing it. This is obviously a reaction to our dispute but my question is, can they actually stop me crossing a boundary that isn't theirs just because they put a pence over it? There may well be an argument saying I shouldn't be crossing this boundary anyway and that may be true, but does property B have any right to police this section of boundary just because they built a fence there? If this description fails, I'll post a picture. ...then you can post a picture/link to a picture. If you are keeping to the public footpath they can't stop you. They may claim to be in possession of the land, so they are the ones you must deal with. Crikey, just realised why I always lose at charades! I'll post a pic soon. Sorry to waste your time all. Volumiza wrote: Hi again, sorry, I thought I'd done well in explaining this but reading it again, maybe not. I'm trying to be as vague as possible in case our neighbours read this forum too. We have been involved in a lengthy and very stressful dispute regarding their attempt at adverse possession of a strip of our land and encroachment. Things have thankfully quietened down and I don't want to stoke up any further trouble. A lot clearer now, but also a lot to digest..............on the specific point of the 'shared drive', from your description it's not shared but wholly owned by property A. The use may be shared amongst others, but not the ownership. Only the owner of the land can take action on any unauthorised use of that land, if a fence is erected on land not owned by the erector, the fence will belong to the landowner. Heres a URL, hopefully it works, I'm a bit of a luddite I'm afraid! So, can B stop me climbing over this fence? Not B's boundary, not B's land but B erected a fence across the top of A's drive. Does B have the right to stop anyone climbing over this fence? climbing over the fence in itself isn't a crime but it is a civil wrong - it doesn't belong to you so you should only be climbing on it if you've been given permission by the owner. with that in mind, how do you suppose folk would act if they saw someone climbing on their neighbour's car? some may challenge the trespasser - and quite right too - but they'd have no lawful right to stop it (only the owner does). does B own the fence? no they don't - it's clearly not on land they own (but I'm guessing they think they do...). walking across the field is a trespass too and again it would be perfectly reasonable to challenge this but only the landowner has a lawful right to stop it. if the owner of the field is minded to, they could remove the fence and install a gate for you - not sure they're really as bothered by the fence as you think, though, if they've done nothing. A might have a problem with a gate or no fence at all if it means the public might start using the private road. My point is that if anyone has a problem with it and could proceed with any preventative discussion or civil action then surely it could only be either the owner of the field or the owner of the drive 'A', not 'B'. 'B' shouldn't have fenced along a boundary that doesn't belong to them and then try and control others behavior regarding this boundary, or am I wrong? Feel free to tell me I am, Mrs Volumiza does regularly. 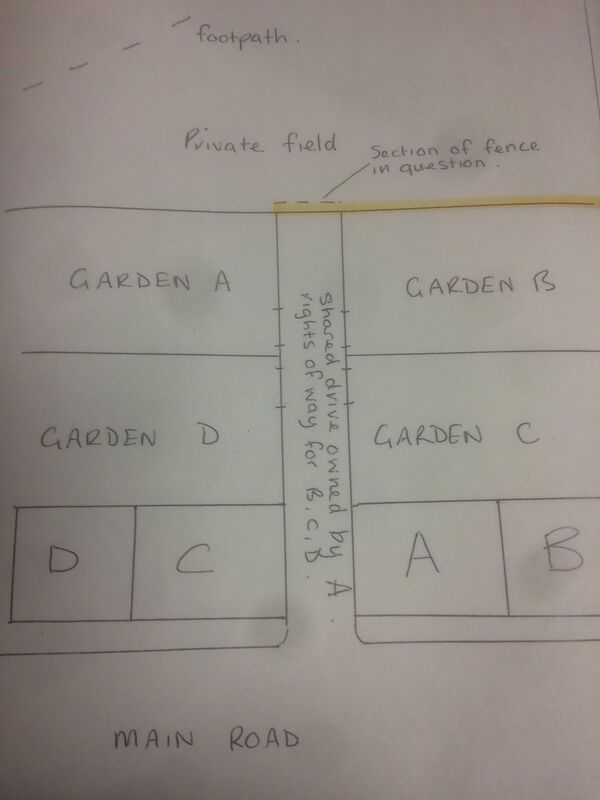 We have had a terrible boundary / adverse possession dispute with 'B' and I just wanted to ask whether or not 'B' have any right at all to stop us hopping over this fence within the part of the boundary that isn't theirs? They have a history of boundary / encroachment disputes with the previous owners of our house, other houses, with the current owner of 'A' and seem to be unable to live within their red lines. So, if I ignore 'B's howls of protest, can he take any litigious action? B has no right to prevent you hopping over the fence. It doesn't even border land he owns. Only the owner of the private field can take any action. On a separate note, this forum has been of so much use over the last 16 months I can't begin to explain. It has helped us realize other people out there are struggling with NFH's and given us some really top advice. Keep it going all. you didn't quite confirm whether you have permission from the owner of the field to climb over his fence and/or to cut across his field as if you owned it? Volumiza wrote: So, can B stop me climbing over this fence? Not B's boundary, not B's land but B erected a fence across the top of A's drive. Does B have the right to stop anyone climbing over this fence? The short answer is no - the fence either belongs to A, or more likely the field owner. I'm assuming the sketch is a very simplified version of the layout of the properties for the purpose of this thread, but I'm struggling to understand how you as D, can have a boundary dispute with B, when your lands don't adjoin................although I can understand if you don't wish to share more on an open forum.